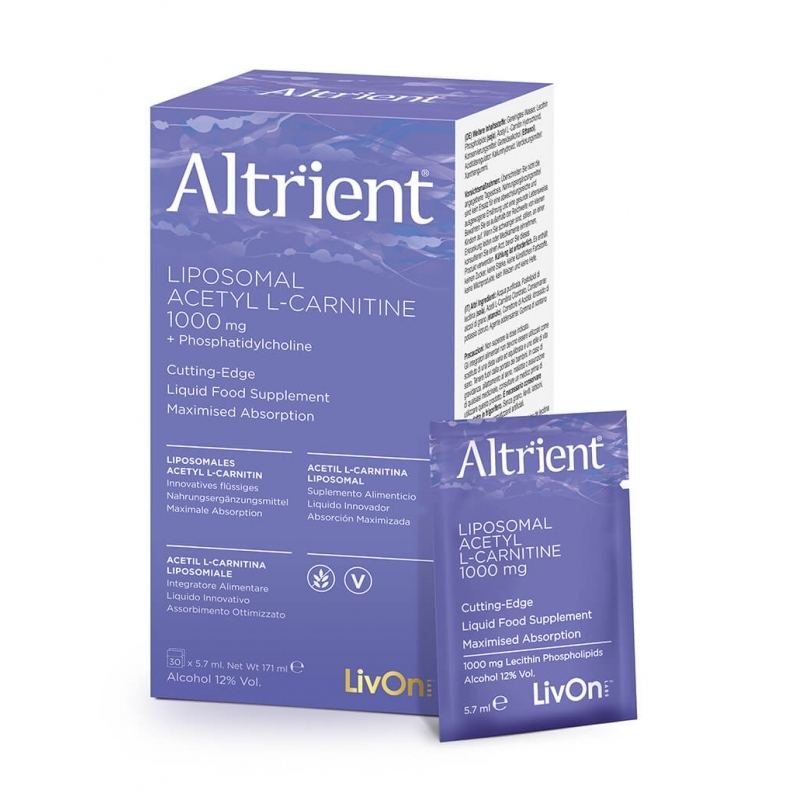 Altrient ALC – Highest Quality Liposomal Acetyl L-Carnitine. One of the body’s valuable amino-acids, supporting, energy levels, mental clarity, fat burning and much more. Acetyl L-Carnitine is one of the body’s valuable amino-acids, providing essential support for fat-busting and energy-making processes in a healthy body. Acetyl L-Carnitine provides support to the metabolism of food, turning it into energy for an alert mind and a fit and healthy body. 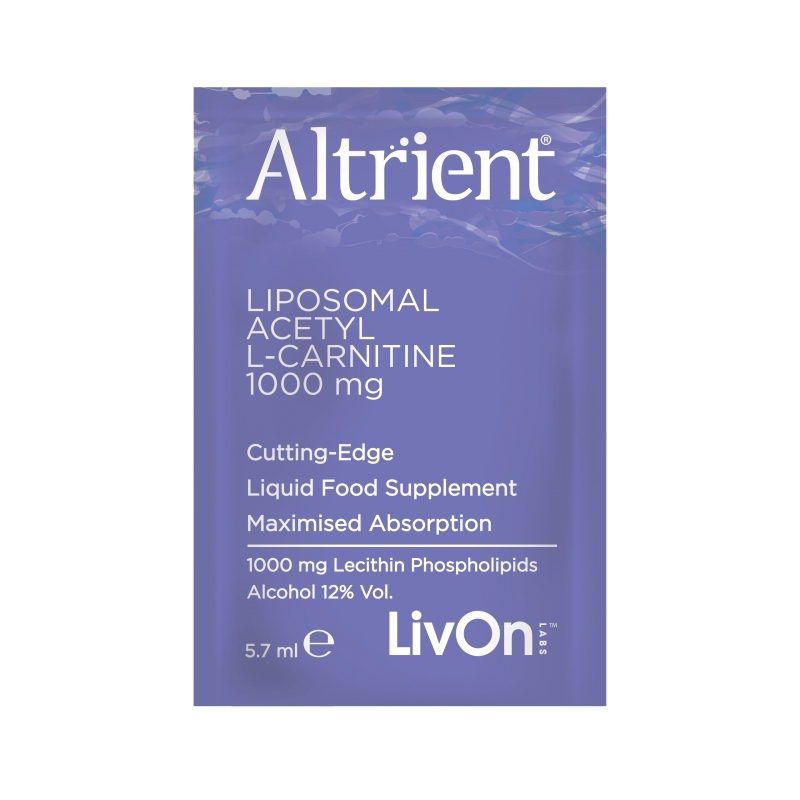 Altrient ALC - Liposomal Acetyl L-Carnitine is one of the body’s valuable amino-acids, providing essential support for fat-busting and energy-making processes in a healthy body. Acetyl L-Carnitine provides support to the metabolism of food, turning it into energy for an alert mind and a fit and healthy body. Red meat and dairy are the richest sources of carnitine, although small amounts can also be found in wheat, avocados, asparagus, tempeh and peanut butter. Carnitine levels decline with age. Carnitine is a naturally occurring substance derived from an amino acid and found in almost all cells in the body particularly in the heart and skeletal muscles which utilise fat for energy. It plays a crucial role in the production of energy in the mitochondria - the powerhouses of the cells, where it transports long-chain fatty acids to be burned or ‘oxidised’ to produce energy. Not only does carnitine increase the mitochondria’s potential to burn fat, it also offers protective effects acting as an antioxidant - thereby alleviating the accumulation of toxic substances produced during the cellular process. The bioavailability of standard Carnitine supplements is very low whereas Altrient liposomal supplements ensure almost complete absorption. By combining its ingredients with essential phospholipids which form a major part of our cell membranes. Through the manufacturing process, these phospholipids form tiny spheres around the water-soluble ingredients. These spheres are known as liposomes. These microscopic liposomal spheres, loaded with ingredients, are almost 100% bioavailable. That is what makes Altrient ALC so effective as almost all the ingredients in each sachet gets into your system and remain available. Ingredients: Deionized Water, Acetyl L-Carnitine, Lecithin Phospholipids, Alcohol, Potassium Hydroxide Chloride (pH Adjustment), Xanthum Gum.